This weeks recipe is a new one for me and the perfect mid-week meal. Super simple, yummy and healthy I promise this will be a new go-to meal! Cashews, veggies and quinoa... I'm there! Preheat moderate oven and grease large casserole dish. Line the bottom of casserole dish with the quinoa and layer diced onion and red capsicum on top. Place diced chicken on-top of vegetables. To make the sauce - place hoisin sauce, garlic, soy sauce and water into a bowl and whisk together. Then evenly pour over chicken. 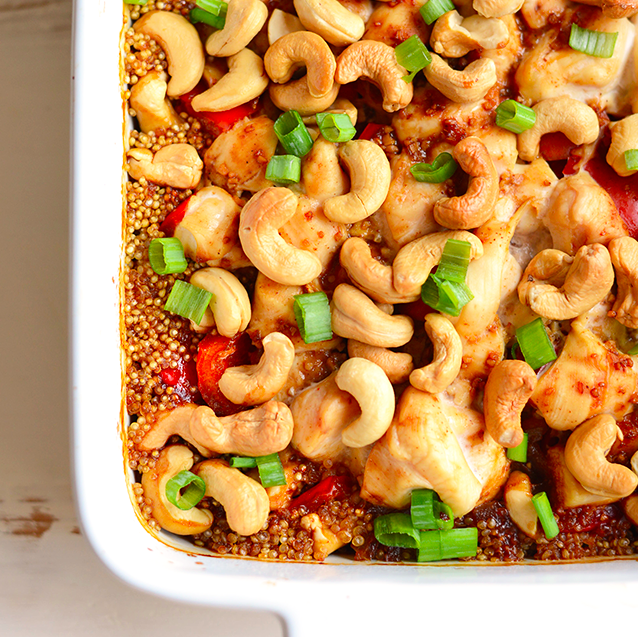 Bake in oven for approx 45 minutes, then sprinkle cashews on top and bake for a further 10 minutes.